This 1,000-square-foot panelized house from GO Home is one of several available to regional buyers who want a predictable, less complicated option for getting a high-performance house. Two New England design/build firms are increasing their commitment to high-end panelized designs, betting that homebuyers will be increasingly interested in well-executed, energy-efficient homes at less than custom prices. Maine-based GO Logic, known for high-performance houses in a contemporary New England architectural style, has launched a line of panelized houses called , along with a new website that makes it easier for buyers to pick layouts, finishes, and features. At the same time, Bensonwood and its younger sister company Unity Homes announced that the company will more than double their combined manufacturing space later this year with the opening of a 110,000-square-foot plant in Keene, New Hampshire. The company hopes the new plant will allow it to expand its market area and push down prices. 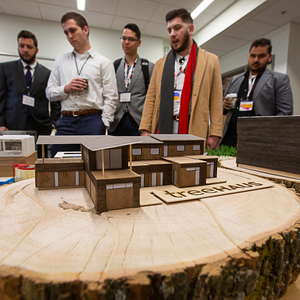 Together, the companies are part of what seems to be a small but growing group of companies that make wall, roof, and floor components that can be assembled into high-performance, even net-zero and Passive House-certified, buildings. Production lines make increased use of computer-driven and robotic equipment. is the 6-year-old sister company of Bensonwood, the firm that grew out of founder Tedd Benson’s revival of New England’s dormant timber-framing tradition. Since its start in the mid-1970s, Bensonwood has gone on to become a well-known design/build firm with timber-themed projects all over the country. Unity Homes, says company marketing communications director Paul van Winkle, is an attempt to deliver net-zero ready home at a lower price. A typical Bensonwood custom house starts at about $950,000 and goes up to $5 million or so, van Winkle says, with per-square-foot prices ranging from $450 to $750 or more, depending on features and finishes. While Bensonwood is a custom builder, Unity Homes is more of an every man’s builder, offering four basic models, what Unity calls “platforms,” that can be modified to suit individual buyers. In addition, the company has a starter cottage and a multifamily design. Houses range in price from $175 to $225 a square foot, van Winkle says, and while less expensive than a custom Bensonwood home, they are built with the same basic technology and components. The combined companies currently have a 42,000-square-foot plant in Walpole, New Hampshire, that produces most of the panels they need. The new facility occupies a converted medical device manufacturing plant. It will allow the companies to introduce a greater degree of automation and improve efficiency, precision, and quality, according to a company news release. The firm will add 20 skilled employees to its 110-member staff when the plant opens, as it looks to triple the current output of 50 Unity houses per year. Like other panelizers, Bensonwood and Unity Homes point to very short on-site construction schedules, precisely made components, and well-insulated, airtight building shells as key advantages of their designs. Benson’s Norwegian heritage and interest in European building models helped create what van Winkle called the company’s “essential DNA.” Although the percentage of residential housing built with prefabricated parts in the U.S. is low — between 3% and 4%, according to The Wall Street Journal — it is 40% in Sweden. “We adopted that methodology many years ago and find it to be extremely beneficial today, especially with the need for building way beyond code, in terms of delivering a full building shell within two weeks,” van Winkle said. The whole process, from the time a customer signs the design contract until the house is ready for occupancy, can be as short as five months. Wall panels are typically insulated with dense-packed cellulose (see the illustration below), although other insulation options are available. 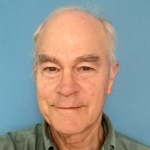 Van Winkle says that insulation packages can be adjusted for different climates, with the shells tight enough to meet the Passive House standard (0.6 air changes per hour at 50 pascals of pressure). Bensonwood and Unity try to minimize the amount of above-grade foam in their houses. Unity Homes says a baseline model can “easily achieve” net-zero or better performance with the addition of a renewable energy system. Van Winkle says the company also can hit Passive House targets, but isn’t going after that market to the exclusion of other buyers. 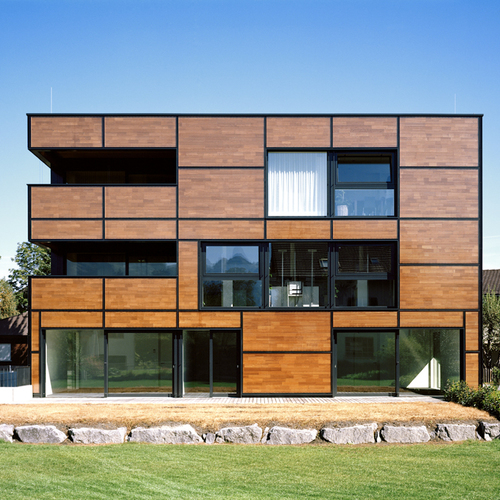 GO Logic’s new Go Home division was set up specifically to tap into the Passive House prefab market with, as the company’s website puts it, a patented shallow foundation system and a panelized building shell that can be used on everything from a 600-square-foot cottage to a 300-unit multifamily building. One of the GO Home options from the company’s website is this 1,600-square-foot model. There are 10 models, including one seasonal residence, ranging from a one-bedroom, one-bath 600-square-foot home to a 2,500-square-foot home with three bedrooms and two baths over two floors. All of them can be customized. Costs (in Maine) run from $179,000 to $567,000 ($298 to $227 per square foot), prices that include just about everything other than the lot, grading and landscaping, fencing, and lighting. The houses come with triple-glazed windows, heat-recovery ventilation, and electric baseboard heat. Buyers can choose from many options. 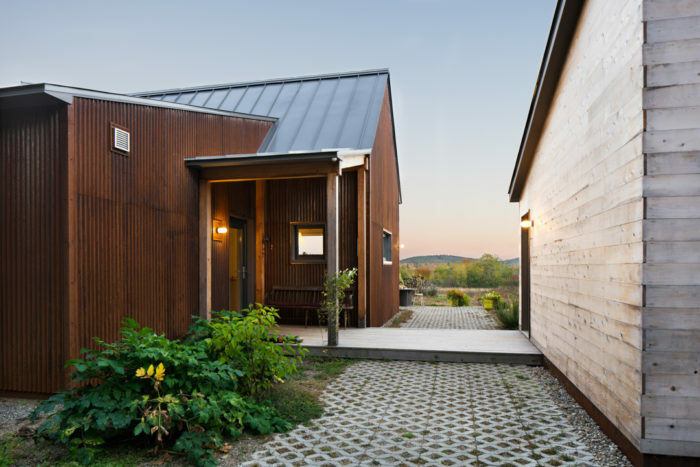 Siding choices, for example, include shou sugi ban (charred cedar finished in the Japanese style), corrugated Corten steel, and a variety of more conventional choices. The frost-protected shallow concrete foundation is insulated with expanded polystyrene rigid foam. 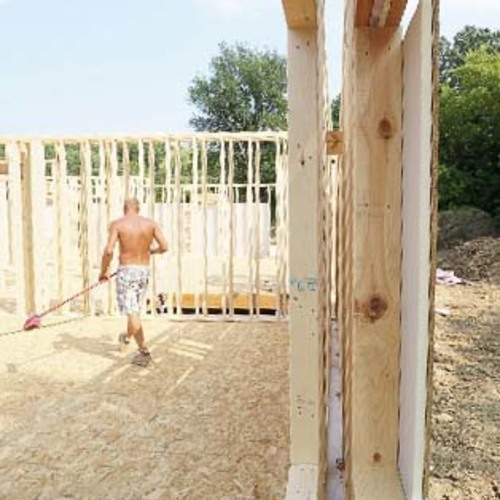 Exterior walls consist of 2×8 structural framing, filled with dense-packed cellulose and an additional 6 inches of rigid mineral wool insulation on the exterior (R-50, according to the company). The truss roof is insulated to R-80 with blown-in cellulose. 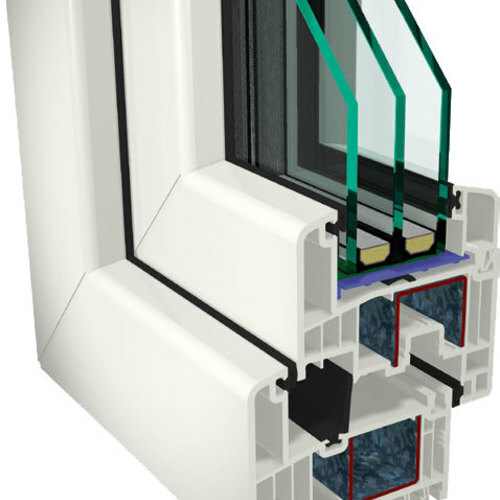 The triple-glazed German windows are R-11 at the center of the glass, and clad in aluminum on the outside and PVC on the inside. Panels are shipped vertically. Wall sections have windows installed when they leave the shop, but stud walls are open to the inside to allow plumbing and wiring to be completed on site. Insulation follows that. GO Home says its buildings use 10% of the energy consumed by a conventional code-compliant house. 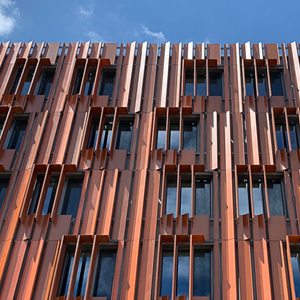 The GO Home series is part of an evolutionary process at GO Logic that grew out of the firm’s more conventional stick-built tradition, Gunther Kragler, a project architect at the firm, said in a call. The company, which sees itself as a regional builder, will still site-build houses if they are within an hour or two of its mid-coast Maine office or close to Portland, where it has established, well-seasoned building crews. But for projects farther away than that, panels make more sense. Panels are made in a shop in Knox, about a 15-minute drive from the firm’s Belfast office. Kragler said the shop was already up and running when GO Home began; whether the production line expands will depend on new demand generated by the GO Home line. 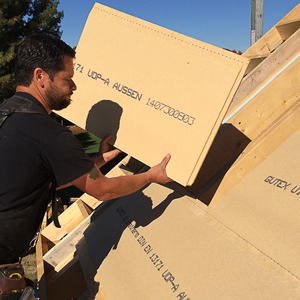 Having a standard line of panelized houses and finish options simplifies the ordering process for clients, who may be overwhelmed not only by the expense of a fully custom house but by the complexities of specifying everything that goes into it. Pricing at the company’s website is clear and direct. Each plan lists the square footage, the cost per square foot, and the total, with the accompanying text describing exactly what’s included and what isn’t. Once a buyer has settled on a basic package, it’s off to to choose siding, exterior finishes, windows, doors, flooring, casing and trim. That list is sent to GO Home, which delivers a final price. A couple could pretty much spec a house at the dining table after supper. 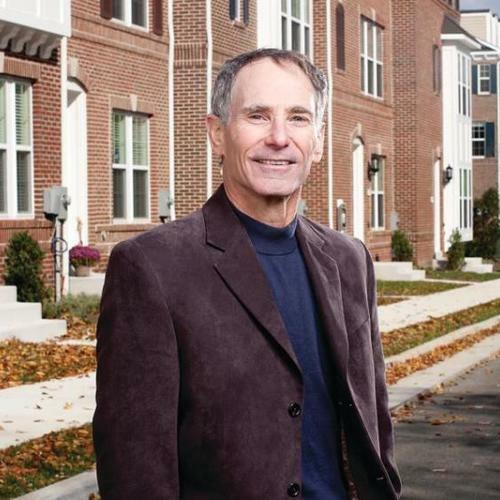 There’s another advantage to panelized housing, says Bensonwood’s van Winkle: Contractors and designers don’t need big crews of skilled carpenters in the field because houses are built under cover on a production line. That’s a good thing, he says, because finding skilled workers is getting tougher all the time. 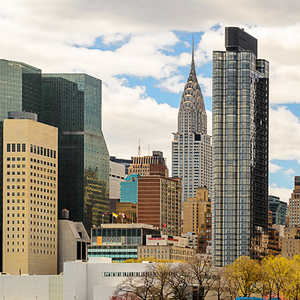 The Wall Street Journal reported that the number of workers employed in construction last year was nearly 30% below the peak of 2006, and more than 15% below the average in the 2000s. Jack Armstrong, the executive director of the Structural Insulated Panel Association, said that tougher efficiency requirements in updated building and energy codes plus the exodus of skilled labor from the construction industry during the recession of 2008 could add some push to the panelization market.